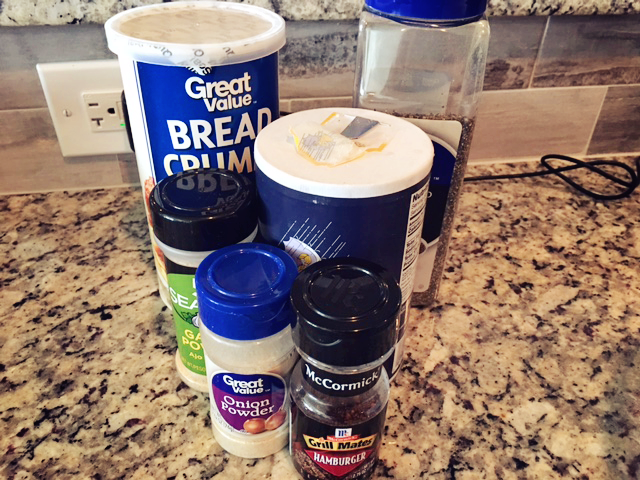 It has been a while since we have shared a recipe – in fact, I can’t recall the last time. We used to do this a lot, back in the day. So why not get back to that? On Sunday we hosted a Super Bowl party at our house and we had decided to just have “snacky” things. This would have been perfect if we would have just stuck to chips & dip – but quickly we turned it into a full menu: sliders (two kinds), pepperoni & mozzarella braided bread, a bucket of guacamole, taquitos, queso, meat & cheese plate, rum cake, chocolate cake, chips & dip and jalapeno popper dip w/ baguets. Glad we kept it “snacky”. 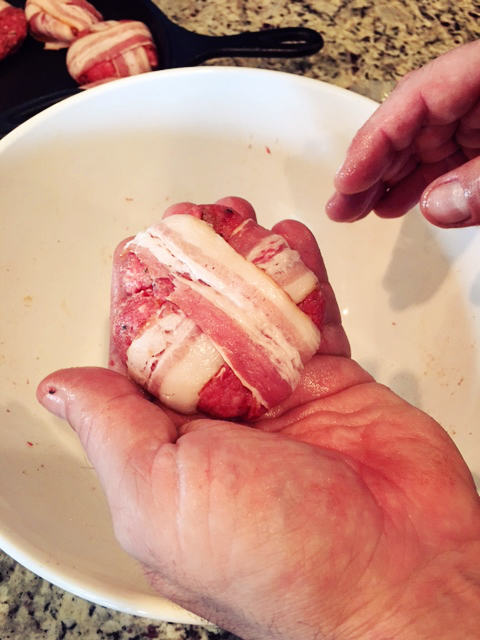 So one of our contributions was a bacon wrapped cheeseburger that was a hit. So here is a quick walk thru of our method to this perfect slider. Step 1… beer. As always. Beers and more beers. Just kidding. Kinda. Once you have gathered all your goods – let’s get to marrying these things together. 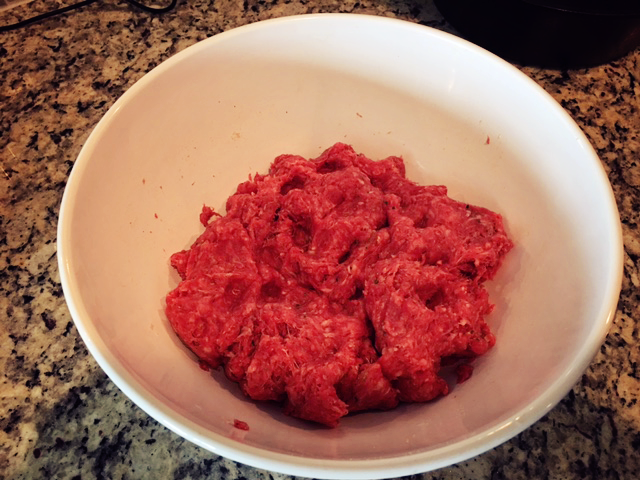 First thing first, put your beef in a bowl and throw an egg & breadcrumbs in there and work that all equally. I wish I could tell you how much of each thing – but honestly I’m an eyeball-er. I season by look, smell, and taste. 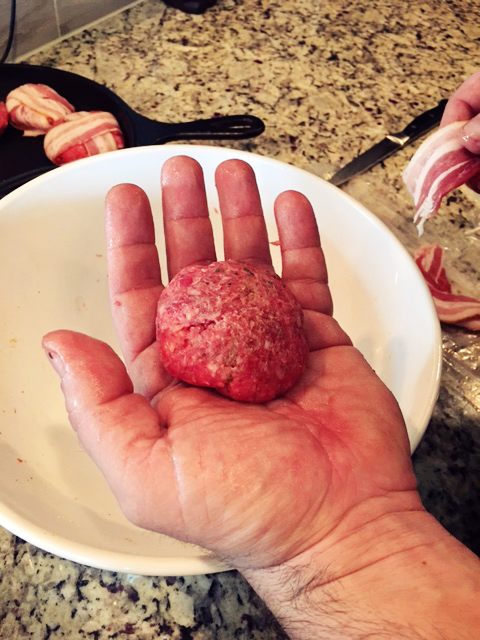 Once you have made a good sized ball, take and wrap that bad boy with the bacon. Try not to drool on it while doing so. 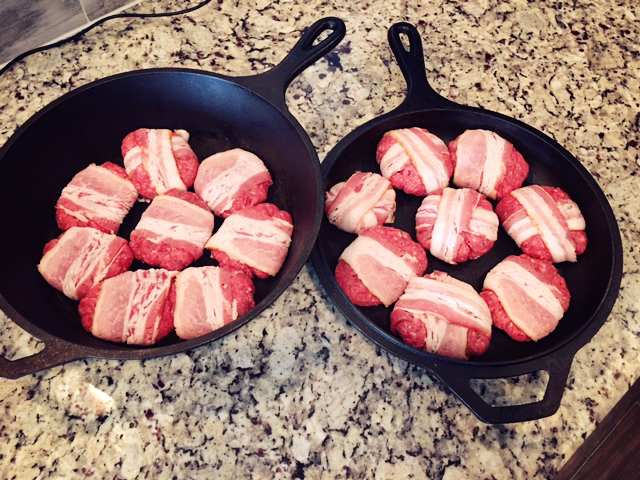 I cut the bacon in half, then with the thicker side of the bacon I was able to wrap most of the meatballs just once and it was good enough for me. With the Thinner pieces I would double wrap (like above). Either way, it’s bacon – its burger – can’t go wrong with a bit more. Looking good, but we are only half way there. 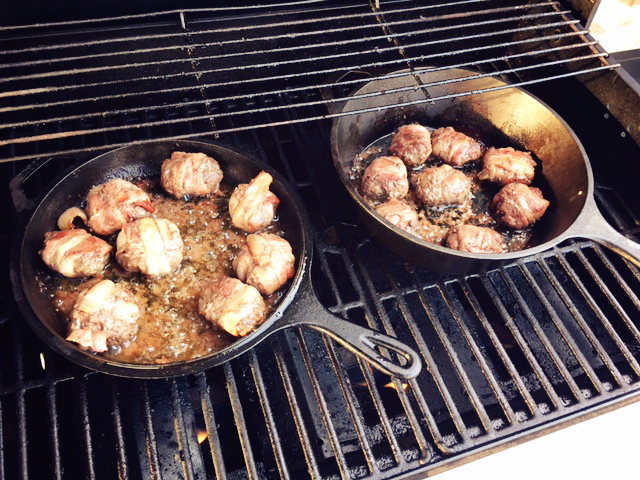 Now if you wanted to cook these inside on the stove top, great – go for it… but I’m a man and men cook on grills. So I cranked up the gas grill to 400 and I put these meaty sliders on the grill. It didn’t take long to get things sizzling. Once the skillets were good and hot, I added the butter to each pan. This is probably overkill – but it was for the Super Bowl… no such thing as overkill. Here is a tasty look of the patties on the grill. Mouth watering? mmmmMmmmm mine is. Let’s see the final product eh? Tasty little bugger – I would say w/ the cheese add, a lil bit of mustard – tasty-tasty. Would recommend. They were also very awesome leftovers. 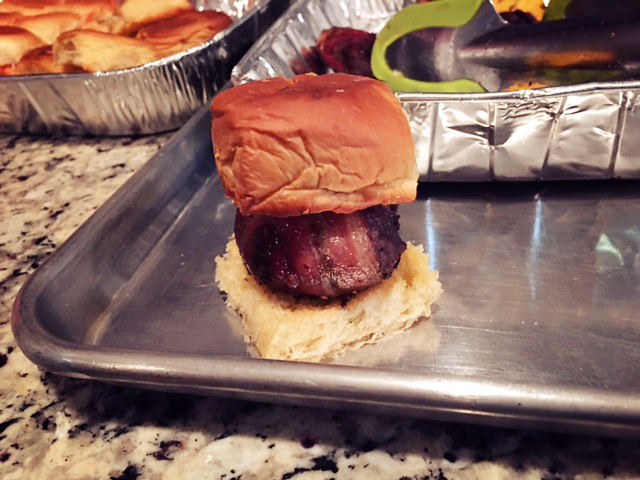 If you are looking for a tasty slider for your next party or just because (Valentines for your man?) 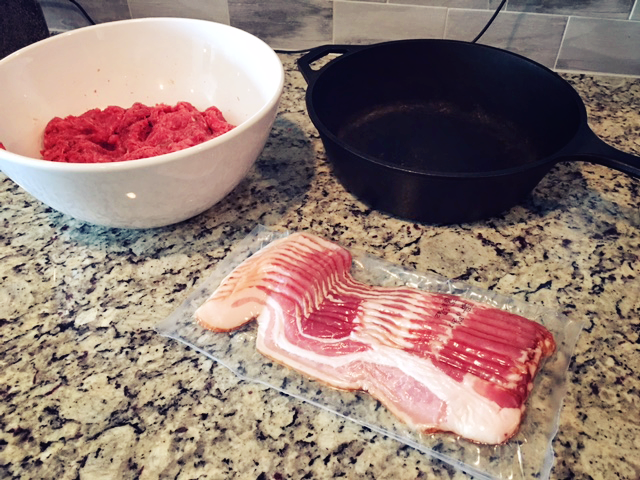 – try these Perfect Bacon Cheeseburger Sliders out. They are $. 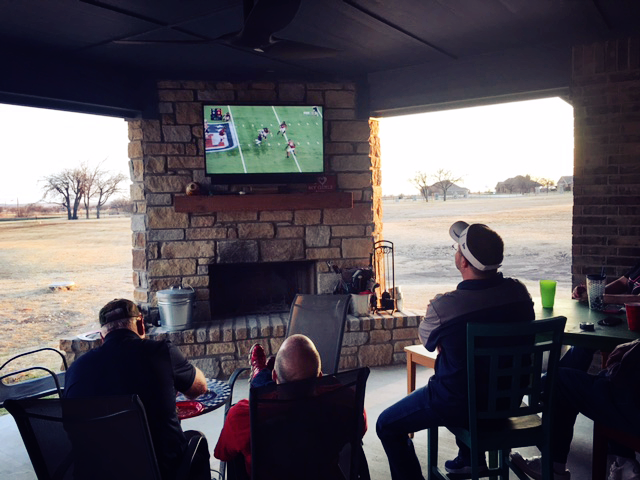 Now here is a picture of us on the patio, enjoying the best Super Bowl of all time. Previous Previous post: I want to be a dinosaur when I grow up.